Susan from Must Love Junk, and myself (Kris) Junk Chic Cottage wanted to do a regular feature on our blogs, something unique that hasn't been done before. So we came up with an idea to 'spotlight the real life behind the blogger' in a more personal way. There is so much talent and inspiration in blogland, and we thought it would be fun to bring you a closer look at the person behind the blog. Every week on Saturday we will spotlight a blogger and have them tell us a little bit about themselves and their blogs. You will be able to see and read about each of the bloggers on both Susan's and my blog. Good Saturday Morning to all of you. Thanks for coming by to meet and learn about another blogger in the Spotlight Feature. I have the wonderful opportunity today to introduce you to Jennifer from Town and Country Living. Jennifer lives near me but we have not yet met in person but I am hoping that will happen one of these days. I have been following Jennifer's blog for awhile and love her decor style. 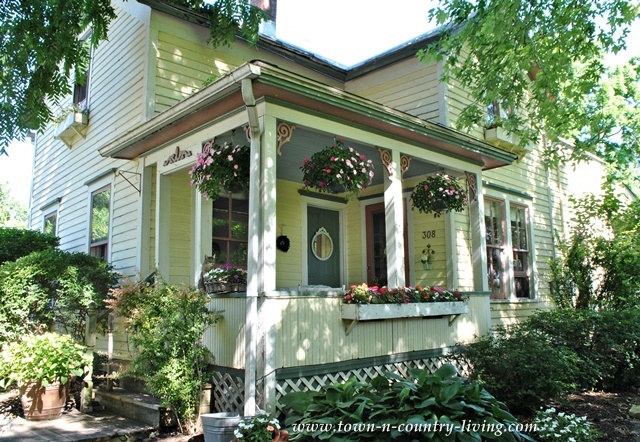 Jennifer lives in a 140 year old farmhouse that is so full of charm. I am always excited when I see that Jennifer has a new post on a room in her charming home. Please grab your coffee and sit back and get to know this special blogger on a more personal level and then jump over to visit her blog. It is beautiful and so full of inspiration. Hello Everyone! I'm Jennifer at Town and Country Living and I'm so honored Kris asked me to be in the spotlight here on her beautiful blog. I've been following Junk Chic Cottage for quite awhile now and am quite envious of Kris' garden and home. So thank you, Kris, for this opportunity to share with your readers! My little blog was born on November 30th, 2011. †After stumbling across so many inspirational decorating blogs, I decided to try my hand at it. Was I nervous? Heck yes! I had a point and shoot camera and knew nothing about photography, but I was determined. My thought was that blogging would motivate me to get stuff done around the house ... so I'd have something to blog about! This is my humble home, a circa 1875 farmhouse that lives where the suburban streets of Chicago meet the country cornfields of Illinois. I have the best of both worlds where I live - the suburban towns and Chicago to the east, and God's glorious country to the west. And that's why my blog is called Town and Country Living. Next to God, my family is the most important thing in my life. My 3 children are grown (upper left corner) and both my daughters were recently married. 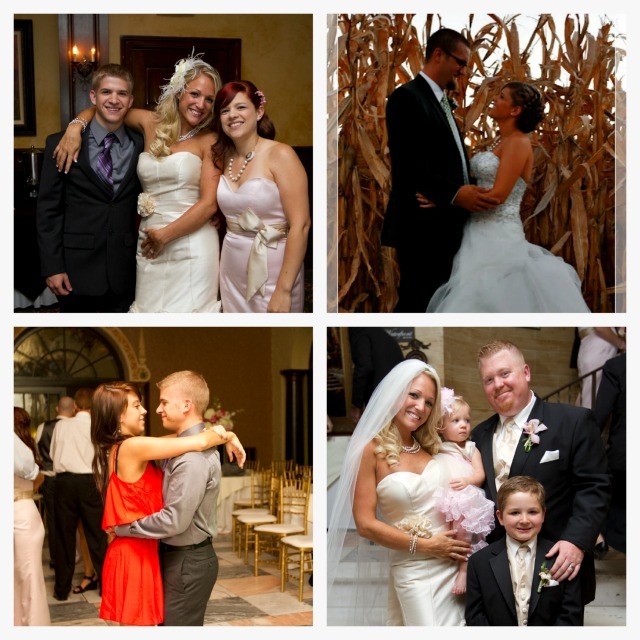 My daughter Bridget married Zac (upper right) at a country farm wedding while daughter Stephanie married Matt (lower right) in a formal hotel wedding. My son Cory is pictured at lower left with Amy, his adorable girlfriend of 3 years. 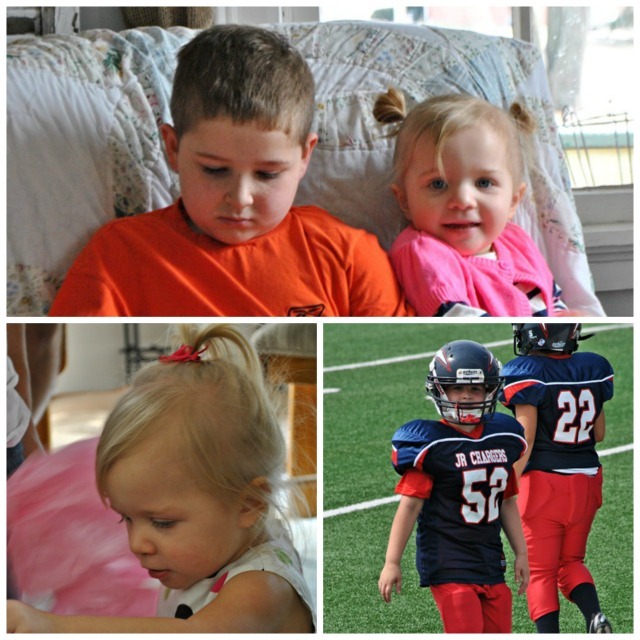 My grandchildren are the light of my life and keep me young. I always wish I could spend more time with them! 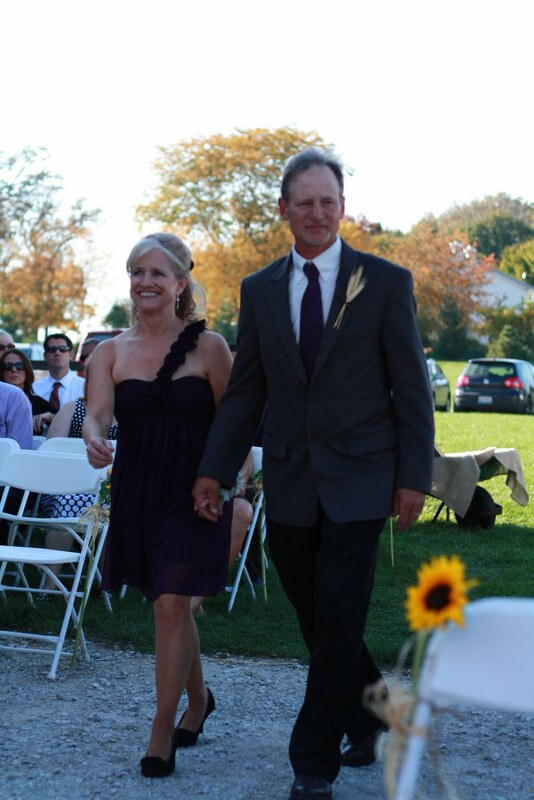 Here I am with hubby Robert walking down the aisle at Bridget's farm wedding. It was a gorgeous day! Robert is my soul mate and he really keeps me grounded. When I'm trying to make everything perfect, he brings me back down to earth and reality! On my blog, I mostly write about my home. There's a lot of upkeep to a 140-year old house! Floors and doors are crooked, the exterior clapboard siding needs to be painted every 10 years, and it seems something needs to be done with the plumbing every year. But I love our charming old home and overall it's surprisingly solid. In addition to decorating, I also love to cook! I'm a vegetarian but I do cook meat for the rest of my family. I'm a bit of a foodie and prefer making meals from scratch whenever possible. I also enjoy using fresh produce from local farm markets in my recipes. Since I love to cook and eat, I need to work off those calories! 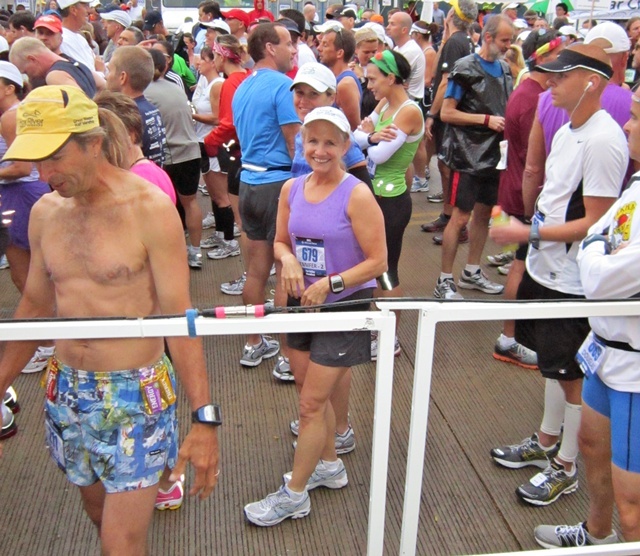 †One of my passions is running and here I am at the start of the Fox Valley Marathon 2 years ago. A marathon is 26.2 miles and you burn a lot of calories training for this event! 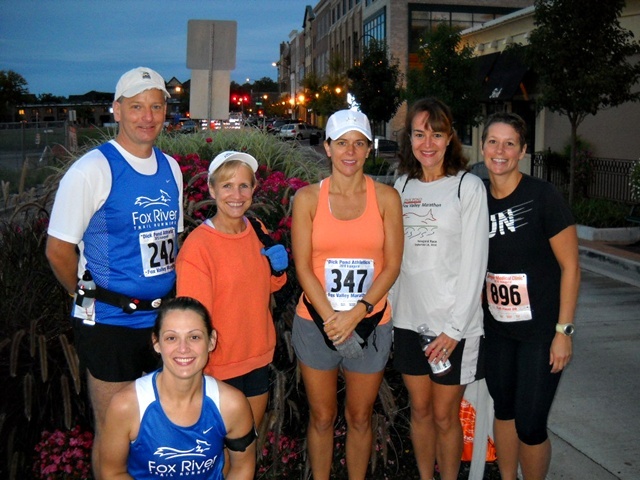 This November, I'm running my 6th marathon - the Naperville Marathon. I'm running it with my daughter Bridget, it's her first marathon! 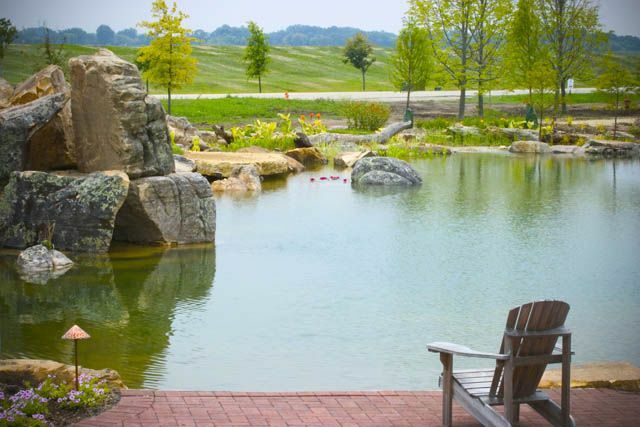 This is the home of Aquascape, Inc, the largest water gardening company in North America. †We call this building "Aqualand, a workplace utopia." 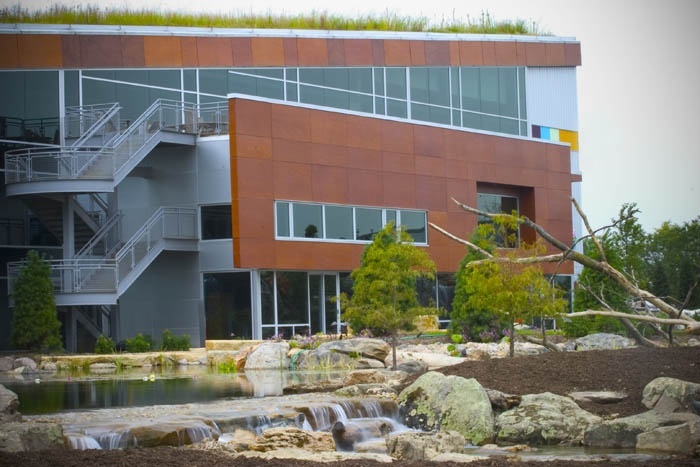 I am truly privileged to work in this LEED Certified building (Leadership in Energy and Environmental Design) where we work with contractors and retailers to help create beautiful water features in backyards across the USA and Canada. This is my view from work every day! I'm the marketing communications manager for Aquascape, which means I'm in charge of the company's social media, PR, and various communication vehicles like e-newsletters to pond installers, retailers, and consumers. I've written a book, The Pond Builders Guide to Break Even, and I write articles for various trade magazines in the landscape industry. I love my job and am so grateful to do what I love every day! So ... back to my blog, Town and Country Living. 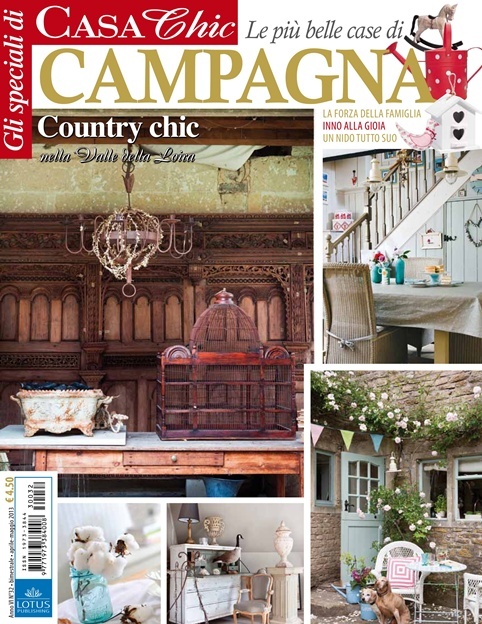 Last year my home was featured in Casa Chic magazine, which is sold in France and Italy. Remember when I was talking about that point and shoot camera? I traded it in for a Nikon D3000 and worked really hard on my photography. This all paid off when the editor of Casa Chic came knocking and asked if I would share my photos of my home with the magazine. Um, YES!! I was so honored to have my photos published! †And earlier this year, a photographer for Country Sampler Magazine was in my home taking photos, which should appear in their March 2014 edition. These are my biggest claims to fame from my little old blog! 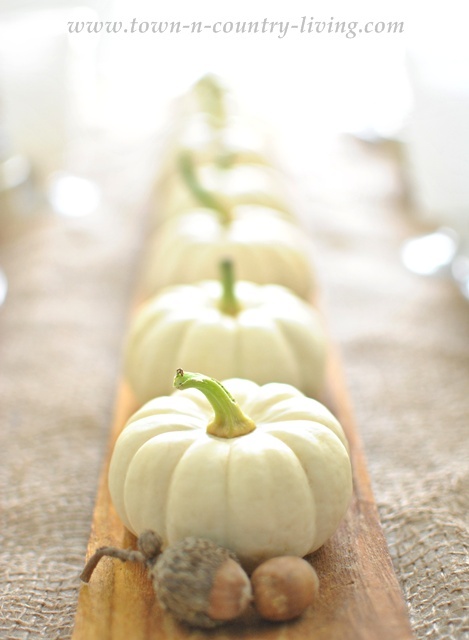 My latest blog post at Town and Country Living showcases a Fall table setting in my kitchen's dining nook where I lined up Baby Boos and acorns on a French bread board for the centerpiece. My decorating style is a mix of farmhouse and cottage. The last thing I'd like to share is ... keep working toward your goals and don't let anything or anyone deter you. In a marathon, you put one foot in front of the other until you reach your goal. The same is true with anything in life. When you hit a roadblock, learn from it and figure out what to do differently to overcome the obstacle. This is the stuff that makes you stronger! Thanks again, Kris, for allowing me to share a little bit about myself, my dreams, and my goals with your readers! I hope you'll visit my blog over at Town and Country Living. Or you can follow me via email or on the social sites below! Thanks so much Jennifer. I loved getting to know you better. It was fun to see your wonderful pictures and learn more about you and your family. Now after learning about Jennifer on my blog you can hope over to Susan's blog and meet and learn about Jann from Have A Daily Cup of Mrs. Olson. I follow Jennifer's blog...it was great getting to know more about her. Great choice Kris. Beautiful farm - just love it. Loved seeing all her wonderful pictures. So nice to meet such a great gal! Jennifer's blog sounds just like my cup of tea. Will do some hopping to meet her and Susan. Thanks Kris for another inspiring blog to learn about! 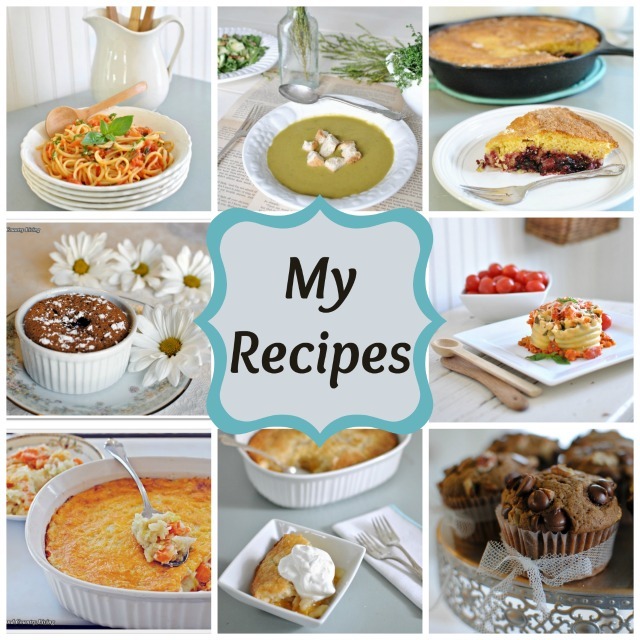 I love reading Jennifer's posts and seeing what she has to share in her home. She always has great ideas that are affordable, too. Love her work view! No way you could get stressed at work with a view like that. Thanks for featuring Jennifer, Kris! I just love her blog! She has some wonderful ideas! Loved this interview with one of my favorite bloggers Kris. Jennifer is a great inspiration. What an inspiration!! She does everything! I love her home and her spirit. I love Jennifer's home, she has an amazing eye for detail and a lovely style. Great choice for a feature! Love, love Jennifer's blog....her home is gorgeous and how great is must be to live a "country life" and yet be so close to the city...How wonderful to go into work everyday and love what you are doing...and have a view like that...Jennifer, you are so very talented...and loved reading your story today....thanks Kris for this wonderful feature today...Have a beautiful weekend Kris and Jennifer! I have followed Jennifer for a long time and really enjoyed learning more about her. I had no idea she was a marathon runner and that she worked outside the home. How/when does she find the time to blog. What is in the water in Illinois? So many of my favorite bloggers are from your area. I adore her beautiful home! What a dream to live in 100 year old farm home. I love old homes, but they are a lot of up keep. Her decorating style is amazing and how awesome to be published twice! Looking forward to getting to know her better! I adore Jennifer's blog and I remember her two daughter's getting married and their weddings. She is quite something running these marathons. If I could still physically run I wouldn't be doing marathons. I love seeing the sites she sees when she runs. Great sense of style too. I really enjoy this series so much Kris, you know that!! I love Jennifer's blog! If I had a view like that from my office window, I'd want to live at work. What a beautiful home and family she has. I really enjoy Jennifer's blog. She has such a lovely home that is always full of so much inspiration! LOVE it!!! 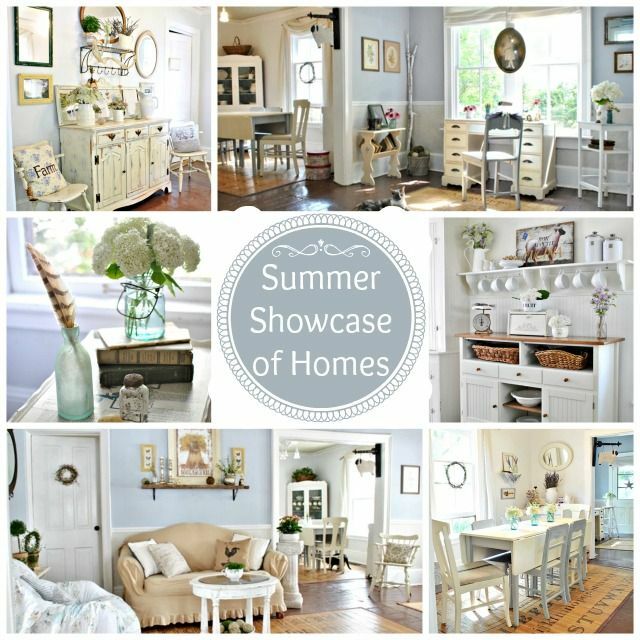 Jennifer is oe of my favorite blogs to visit - a super cute house. Thanks, Kris for sharing your blog home with me! And thanks to everyone for the truly kind comments. I'm humbled. I love Jennifer's blog and home, and I enjoyed this post knowing more about her life. What a great interview! What a great idea Kris, it's so cool getting to know our favorite bloggers better. Jennifer has been an inspiration to me for a long time! I had no idea she was so busy, funny how we imagine these talented women painting and crafting all day when sometimes they're busier than we are, love this series Kris! Holy Moly! All this time I've been admiring Jennifer a ton for her beyond-beautiful blog, and now I know in addition to her blog she has an amazing high powered job and runs MARATHONS! I'm bowled over. Oh, plus, she's an incredibly nice person. I love learning about the women behind the blogs in your spotlight series, Susan and Kris. I love Jennifer's blog, and it was fun to learn more about her here! Love reading about Jennifer, and getting to know more about her. I think I need classes from her on time management! what an amazing place to work!